While David Tracy and I were driving up to a stunning secret car collection, I managed to take a curve sort of wide and run over some rumble strips. That got us thinking about rumble strips, which got me thinking about the various musical highway projects, where grooves in the road make music when driven over. And from there I started to realize that grooves in highways can store data, which is where I’m heading here. Here’s the idea: a car would have a pair of vibration sensors, one watching a wheel on each side of the car. I’m thinking something like a laser-based distance-measuring sensor, each keyed to the upper surface of the tire. In the road, there’d be two wide strips, one under each side of the car, and on these strips would be a pattern of raised bumps and shallow depressions. When the car’s wheel hit a raised bump, the sensor would read the now shorter distance between the tire and sensor, and that’s a 1. When the wheel drops a bit into the hollow, that’s a 0. So here we’re able to read bits of data. Keep in mind these “strips” could be nothing more than grooves cut into the road in the proper patterns. Raised areas could just be the road surface, and the 0s could be the groves. This could be very minimal, and, based on the sensitivity of these sorts of sensors, even cheap ones, the patterns of grooves could be subtle enough that it wouldn’t even be detectable to the car’s occupants. I think. These 0s and 1 would be sent to a computer in the car, and, of course, that computer and sensor combination would be constantly evaluating the baseline road surface so that the bumps and depressions could be evaluated from the overall “noise” of the imperfect road surface. You’d need file headers and probably redundant data on the strips for error correction, but I think this should be possible. A modern computer reading a sensor like this should be able to process these changes in distance incredibly quickly, but just to be conservative and allow for large enough bumps and recesses to withstand the rigors of road wear and tear, let’s say each “bit” is one inch apart. So, that gives us a density of 63,360 bits per mile, which comes to 7920 bytes per mile, then we can multiply that by two, since we have left and right tracks, one for each side of the car with tires. That gives us a total of about 15.4 K.
That means that, at 60 MPH, you’d have a data throughput rate of about 16K/min. I’m pretty sure modern computers can handle that. That’s a decent amount of data, really. I mean, not by modern standards, but it’s worth remembering that the original arcade Pac-Man’s program and graphics data was just about that size. Essentially, this is like the car is a “read head” on a tape deck, or even like the laser in a CD drive. CDs stored data in tiny pits on the surface of the CD– this is basically the same idea, just much larger in physical scale. Lane-changing may be an issue, but if it’s the same data across all lanes, then the error-correcting checksums in the car’s computer and redundancy in the road data should handle the temporary loss of data input during lane-changing. I like the fundamental idea of this: information could be hard-coded into sections of road, and cars could ‘read’ this data as they drove over it. To what purpose, though? I suppose if you’re in an autonomous car in an area with minimal or no GPS or cell coverage, important information about the road or local environment could be sent to the car via a system like this. I suppose it wouldn’t even need to be autonomous – 16K is plenty for text data that could be sent to a car driving over the area, and messages could be displayed on the car’s dash. Over enough distance, enough data could be sent to a car via the road to send an audio file that the car could play back; a sort of guided tour of a given stretch of road, or curated music, even. To do this well the data density would likely need to be greater, but I suspect that’s possible. This method would be a cheap way to encode information cars may need without having to provide electricity or equipment to broadcast the data. Maybe the data could tell the car’s internal computers ideal settings and parameters for navigating the road safely, quickly, and in comfort, or warning about upcoming issues. Hell, maybe they’d encode advertising, or use it as a confirmation system for car-tracking tools to prove a car was where the GPS tracker said it was. I’m not sure about what to do with this idea, or even if it makes any sense at all. I just like it, conceptually, and wanted to see if any of our alarmingly bright readers might have some clever ideas. So, how about it? 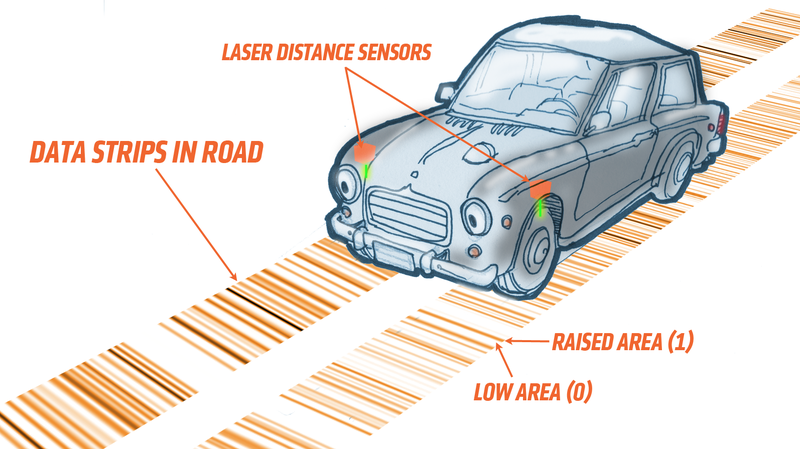 If we can encode data in roads, and cars can read that data, what could we do with that? Just cut me in halvsies on any million-dollar ideas you have for this, cool?